Jasper Engines & Transmissions announces the release of an extension to the current Chrysler 5.7L HEMI V8 product line. One of the many value-added improvements JASPER made was redesigning the piston. Along with graphite-coated skirts to prevent piston scuffing, and dry start up, these JASPER redesigned pistons offer additional advantages. According to the company, a JASPER redesigned piston has 40% stronger compression lands compared to OE first generation design, for reduced ring heat and improved ring sealing. It’s engineered with twice the piston skirt, or thrust area, compared to OE second generation design, for improved durability and reduced scuffing tendency. Two additional center skirt drainbacks provide 3X more oil return to prevent the oil ring from sticking and reduce oil consumption. Finally, JASPER pistons utilize a greater pin bore area, with a full-floating pin design, that reduces scuffing. In addition, the remanufactured HEMI V8 uses JASPER-designed multi-layer steel head gaskets to ensure superior protection against leaks. They feature a larger firing ring bore with improved embossment for a better combustion seal. JASPER’s MLS gaskets are more robust in design, which helps prevent leaks and maintains OE compression ratio. The outer gasket layers are also PTFE coated to reduce wear. The 5.7L HEMI V8 is covered by JASPER’s 3-Year/100,000 Mile nationwide, transferable, parts and labor warranty. Full warranty disclosure is available on our website, or upon request. 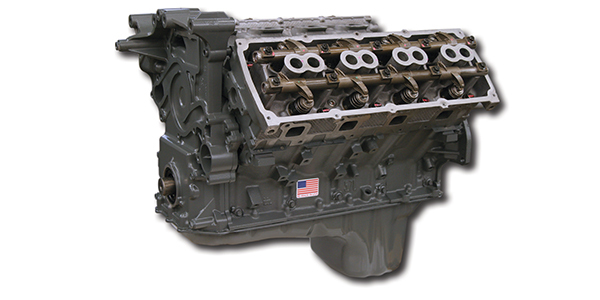 For more information on the remanufactured products of Jasper Engines & Transmissions, call 800-827-7455 or visit jasperengines.com.